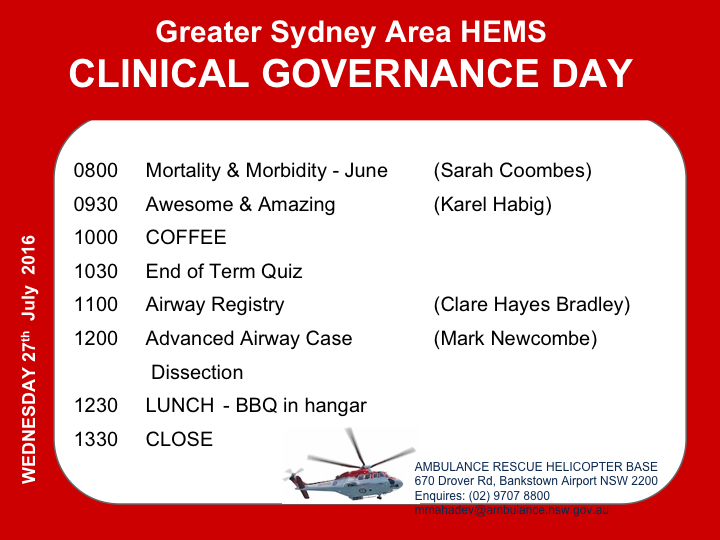 Next week’s CGD will include a review of June’s Mortality & Morbidity as well as the Airway Registry. We will also hear from Mark Newcombe’s recent first hand experience of the Advanced Airway HOP. How would you have approached this difficult intubation in the middle of the night?! Keeping things light hearted but always educational, there will be an end of term quiz (with prizes!). As another 6 month term draws to a close, we would like to thank this fantastic registrar group for all your hard work and commitment. If you are leaving us in August then we wish you all the best in your next endeavours and if you are staying then we look forward to an action packed next term!